I need to calculate sample sizes providing CV=0.26 and ratio varying from 0.85 to 1.20 with step 0,05. How to make a script in R which returns a table with results? you can easily put it inside a little function if the purpose is specifcally to "return" the data frame (as in, a table). You can make the code totally fancier and totally unreadable by using sapply or some similar function - I am sure this is what the code police recommends. 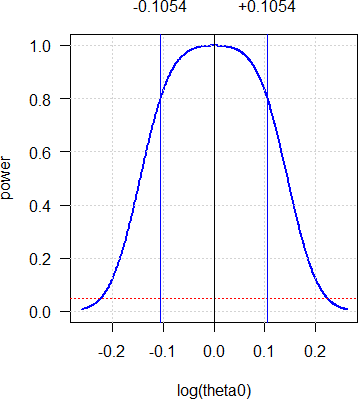 Note that power curves are not symmetrical around 100%. If you assume a ∆ of 10% (without knowing whether T will be lower or higher than R), work with 0.90. The sample size will cover 1.10 as well. Do you get the idea? No, I didn't catch an idea. Do you think that absence of symmetry critical? » No, I didn't catch an idea. » Do you think that absence of symmetry critical? Press ⏎ or click in the graphics window to go to the next plot. To switch between plots navigate to the graphics window and use Page ⇑ / Page ⇓ to switch plots. 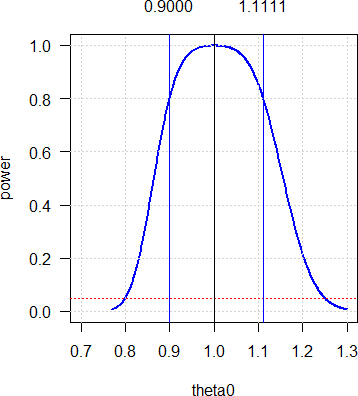 The power curve is positively skewed. For any –∆ you get the same power at 1/∆. In the example: For GMR 1.1111 as for GMR 0.90 since 1/0.90 = 1.1111. In many protocols I read “planned for a T/R-ratio of 0.90 to 1.10”. Nope. If the sample size estimation was done for 0.90 it covers anything up to 1.1111. Or the other way ’round: If it was done for 1.10 it would cover anything down to only 1/1.1 = 0.9091 (and not 0.90). Hence, the latter is stupid – unless you know (!) that the GMR will be >1. If you don’t know the sign of ∆, always plan for a GMR <1 and you will be on the safe side. no need to copypaste my entire code. online 5 (1 registered, 4 guests [including 5 identified bots]).